Poor posture is the most common reason many people will complain about neck pain during their lifetime. Luckily, several lifestyle habits that cause neck pain can be reversed. 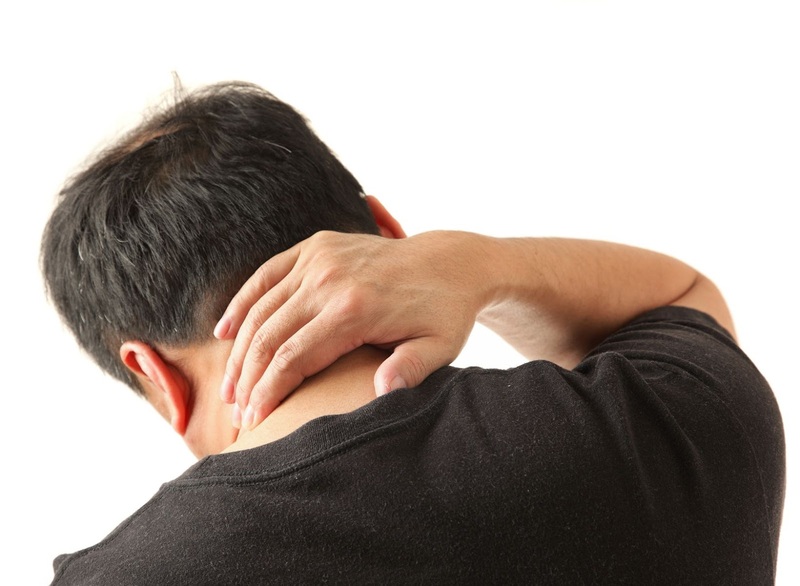 Most typically experience pain in the back of the neck where the postural muscles are located. Trapezius, splenius capitis, erector spinae, and the suboccipital group are a few of the muscles continuously working to hold the head upright. These postural muscles become tight, tense, and overworked when the head is too far forward. When muscles are continuously contracted and overstretched they become depleted of water and nutrients usually creating trigger points. Tension headaches are the result of trigger points in the upper trapezius muscle that refer pain to the temples. When the head is too far forward, the ear is in front of the shoulder, the muscles in the front of the neck such as the scalenes and sternocleidomastoid are shortened pulling the head forward. Those who treat themselves at home with a sports cream or a hot or cold pack usually don’t think about the front of the neck. Unfortunately some massage therapists may overlook these muscles as well. Assessing one’s lifestyle and habits, especially when a considerable amount of time is involved performing a given task, can help alleviate the potential causes of neck pain. Writers and office workers can develop neck pain if their workstation is not properly set up. The computer screen should be level with the eyes to prevent straining the neck muscles. Those of us who work on a laptop are at a disadvantage. In order for the screen to be eye level the keyboard will most likely be too high for us to reach. If the table is too high, or the chair too low, many will have to elevate the shoulders to reach the keyboard. Lifting the shoulders to reach the desk or keyboard will result in a continuous contraction of neck and shoulder muscles. When using a mouse make sure it is close so that your arm isn’t continuously reaching for it. Over time the shoulder will project forward and create tension between the shoulder blades as well as the upper trapezius. Those who use the telephone regularly should invest in a headset. Otherwise the neck muscles will be overworked by holding a phone to the ear with the shoulder. Carrying a heavy bag repeatedly on the same side of the body will create shoulder and neck tension. Try to switch shoulders when carrying a heavy bag or purse or look for a bag that distributes the weight evenly. If you can forego the fashion trend of an over sized bag and carry a smaller version your neck will thank you for it. For those who cannot escape with a small bag look for an ergonomic bag that distributes the weight evenly. May ergonomic bags are worn across the body or carried on both shoulders simultaneously. Some backpacks are now equipped with wheels and a handle so that they can be pulled instead of carried. There are two explanations for those who wake up with more neck pain than they had the night before. Tight neck muscles are depleted of circulation, but they receive a greater blood supply during the day than at night. As people go about their daily chores the neck muscles are constantly in use. When muscles contract and relax they release metabolic wastes and absorb fresh fluids. Yes, it may not be the ideal amount, but when we sleep the neck muscles are at rest for roughly 8 hours. Sleeping gives tight muscles a chance to stiffen because circulation is diminished from lack of use. The more obvious explanation is poor alignment and support of the neck while sleeping. There are a variety of pillows available for back, stomach, and side sleepers, but many of us rotate through all 3 positions during the night. Unfortunately I’ve never seen one pillow that can accommodate all sleepers. Back sleepers need cervical support with a flatter surface for the head to rest on. Those who sleep on their side need a pillow roughly as thick as the distance between the ear and shoulder. The head should be in alignment with the spine and the pillow should help take pressure off of the bottom shoulder. Although sleeping on your stomach can be cozy it’s one of the worst positions for those suffering from lower back pain. Stomach sleepers need a flatter pillow to keep the neck in line with the spine. Hobbies are meant to help a person unwind from the stresses of life, but they can contribute to neck pain as well. Of course, if you sustain a blow to the head playing soccer, football, or rugby your neck will probably hurt. Most people don’t think about the sedentary hobbies such as scrap-booking, knitting, and cross-stitch. When a person looks down for extended periods of time on a regular basis it will put a strain on the postural muscles of the neck. It is essentially the same as having a forward head posture. Special neruons called proprioceptors continuously monitor our joints and muscles to to let out body know where we are in relation to the horizon. Many of us have misaligned skeletons due to muscle tension asymmetry. However, we don’t typically see people walking around bent to the side. When the body is crooked the brain will recruit muscles to realign the body with gravity and the horizon. For example, if the right hip is high we would expect to see the torso lean to the left. In this case the brain will shorten the muscles on the right side of the lower back in an attempt to bring the body back to center. Now the torso is slightly off so muscles on the left side of the upper to mid back will tighten. The neck unfortunately is the final balancing point for the brain to level the eyes with the horizon, hence the reason so many people complain of neck pain. Standing in front of a mirror look at your shoulders. There are a few common patterns that create neck and shoulder pain. Is one shoulder higher than the other? A high shoulder can be the result of carrying a heavy bag, holding the phone with the shoulder, carrying a baby, and even sleep. Some people will experience pain on the high shoulder side. Others will feel pain on the lower side even though the muscles are not as tight. As the brain levels the eyes with the horizon a tug-of-war occurs with one side of the neck trying to overpower the other. Is the distance between the shoulder and the center of the body the same on both sides? With the arms relaxed by your sides do your thumbs point forward or do you only see the back of the hand? Both of these questions look to see if the shoulders are rotated forwards. When the shoulders are rotated forward the head is usually pulled forward as well. Unfortunately most of us have this posture because we reach for things all day. Forward head and shoulders will create tension in the neck, shoulders, and upper back between the shoulder blades. To correct this posture the muscles in the chest and neck need to be lengthened by stretching, yoga, and/or massage. Conversely the muscles in the back need to be strengthened, usually with weight training.